How do you combine critical thinking, leadership, a little English, and a budding interest in a possible career path all while having fun? As Peace Corps Volunteers we are constantly trying to identify opportunities where our skills and knowledge overlap with the interests and needs of our community. Sometimes this can be an easy task, but more often than not, it requires a lot of false starts and simple trial and error. 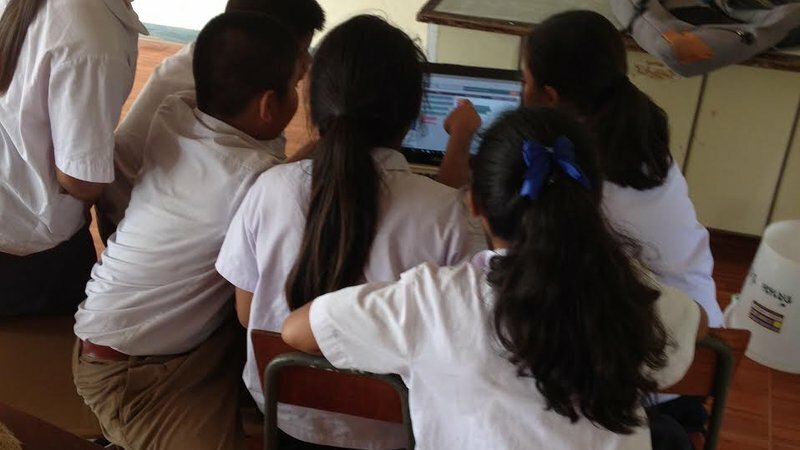 Recently I took a chance to pursue an opportunity to introduce some basic computer programming with the kids in my village after it was mentioned in a Technology for Development (T4D) group chat. It started out small, with one or two kids who come over to my house frequently and a simple question: “Would you like to try a computer program?” And just like that, the wheels were in motion and we were sitting on the floor of my house in front of my computer looking at the screen. Meanwhile, I was wondering, how exactly am I going to explain computer programming, in Thai, to 9- and 10-year-olds? Now you should know a few things about me. I was a history and international studies major in college, my roommates were the computer science majors and the last time I was remotely close to a computer programming class was before Y2K, 17 years ago. But here I was, teaching basic computer programming with a major assist from the Hour of Code project, based on Scratch, a visual programming language developed at the Massachusetts Institute of Technology specifically for younger kids. Together with my handy Thai-English dictionary app, a pen and notebook and some willing kids, we began to tackle the first puzzle. We chose a program that incorporates the characters from the movie “Frozen” and we started by moving Elsa forward in a straight line. As we progressed through the various puzzles, you could see the excitement and the confidence growing as the kids successfully completed the challenges and their determination when they were close but not quite right. Soon I had a line of kids waiting to try the program with one of their peers helping them along the way. The next day, the queue was even longer and the original kids wanted to try the other puzzles as well as help their friends. The project quickly outgrew what I imagined. The first kids were really starting to show some leadership skills and teaching aptitude by helping their friends complete the puzzles when I could not give individual attention. As I sat back watching this project evolve from a few curious and brave kids to a larger group and then to the older boys and girls joining in and eventually to a few of their friends from neighboring villages, I knew we had stumbled on something that really connected with the kids and learning. I also knew that there was far more potential for this type of activity across Peace Corps Volunteer sites. We just needed to start taking notes on what went well and write down suggestions on how to introduce it in a more structured setting. My next step was to introduce the Hour of Code to the kids at my primary school, where my original “programmers” are 4th and 5th graders. I was blown away by the reaction I received. With minimum supervision the primary students were trying their hand at the puzzle on my computer while their classmates watched and gave encouragement and suggestions. I regretted not having more computers so they could work on the puzzles simultaneously, or in smaller groups, but I was encouraged by their persistence and curiosity. I went to search out a technology teacher to help co-lead a lesson. My final challenge was to teach the same lesson, but at an entirely different school without my student helpers. Luckily, the notes from the original programming and teaching sessions provided a list of key English words that would facilitate the lesson without the English instructions and commands being overwhelming yet still challenging enough that the students would have to figure out the puzzles on their own. After a brief meeting with the computer teacher at the middle school and a quick demonstration, we agreed to try it out with the 8th grade class the next afternoon. I was very excited to get to work with the students outside of an English class, but also slightly terrified of teaching an entire class of teenagers by myself with a new co-teacher who had limited English skills. The next afternoon, I went to check with my co-teacher and prepare the computer room so we could jump right into the lesson. Almost immediately things started to go off the expected path. Only a few of the computers would turn on, and of those that would, several had internet connection issues. It was time to adjust on the fly, the very essence of Peace Corps service. Once the kids arrived, we broke them into small groups around the few computers that were working and began. A couple of students caught on relatively quickly, while others experienced problems with their computers or had difficulty completing the puzzles. As I was reviewing with a group of students how to determine the number of degrees in the angle they needed to use something happened. The small group of students at the front of the room, the ones often disengaged during English class, announced that they were done. I went over to check their work and, sure enough, they were on the last puzzle and had figured out the most challenging problems on their own. Not only that, they were now talking with another group and helping them solve a puzzle without explicitly telling them the answer. Suddenly I had peers taking a leadership role and beginning to help me with the other groups. And just like the peer teachers I had cultivated in my village, “students teaching students” was suddenly manifested right before my eyes. I had given them an opportunity and then was able to watch them grow. When class was over, my co-teacher and I asked the students if the program was fun, and they were very enthusiastic and said they wanted to do it again. I also took a moment to thank the students who finished first for their help with the other students. The enthusiasm from the first round of lessons, the lessons I had learned from growing the project with a few brave kids in my living room, to the formal class of students outside my comfort zone, and from the material available from Hour of Code have inspired the T4D committee to continue building off this initial small project into something bigger. Andrew Snyder (BA, MA, MS) is a graduate of Virginia Tech, the University of Georgia and Tulane University. He is serving as a youth development Volunteer in Thailand, where he is a member of the Technology for Development committee. He will be extending his service for a third year to continue to develop youth projects and serve as a Peace Corps Volunteer Liaison.